Australian white opal has a stunning display of colors within the stone, which is a magnificent combination of fire and ice. 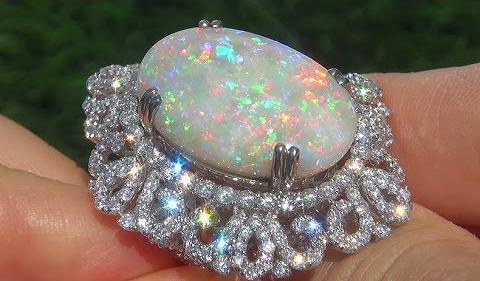 The LC sources this gorgeous stone from Australia, which produces nearly 95 percent of the world’s opal. On July 8, the LC will be offering this treasured gemstone at unbeatable prices. Before tuning in, continue reading to make sure you discover what makes this gemstone so marvelous. Opal features the plays of brilliant colors that go completely through an entire piece of rough. Its unique brilliance of color is reminiscent of the Northern Lights effect in the sky. The unique display of rainbow-like hues that change with the lighting or the angle of observation is what makes Australian White Opal so distinguishable and desirable. Opal consists of silica spheres that are packed together. In precious opals, the special pattern of spheres gives the gemstone the unique natural ability to diffract light. If you were born in October, then you should really enjoy this gemstone because opal is its birthstone. The Romans also cherished this gemstone and considered it to be a symbol of hope and purity. Even Shakespeare coveted this exotic gemstone by referring to it as the Queen of Gems in the Twelfth Night. 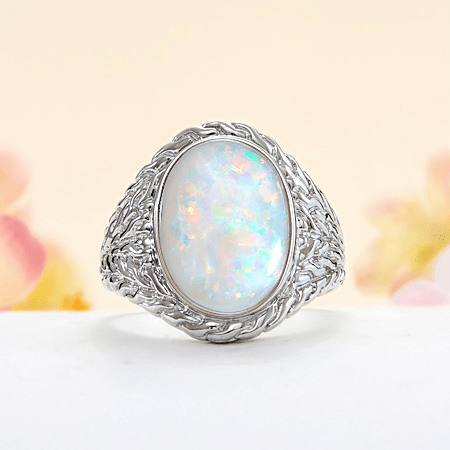 You don’t have to be an iconic poet or part of an ancient culture to appreciate the beauty of opal. You also don’t have to shell out a lot of money to own your own Australian White Opal for that matter. Tune into the LC on July 8 and you’ll be adding this dazzling gemstone to your collection in no time!